For centuries, astronomers have been enchanted by the planet Jupiter, that roiling sea of clouds punctuated by a glowering red eye. But we’ve only had the fuzziest notion of what lies beneath this violent visage—until now. With recent advances in radio telescope technology, astronomers are finally starting to cut through Jupiter’s swirling clouds to see what’s happening down below. Using the Very Large Array in New Mexico, a team led by the University of California, Berkeley, has produced a map of Jupiter’s atmosphere down to 100 km (60 miles) depth, revealing the gas giant’s noxious, ammonia-rich clouds and atmospheric circulation patterns in unprecedented detail. This research, which appears in today’s Science, is a step toward understanding the inner workings of the monstrous planet that scientists believe was responsible for shaping the early solar system. But it’s also a mere taste of what’s to come later this summer, when NASA’s Juno Mission begins probing into the entirely unexplored region at Jupiter’s core. For several decades, astronomers have studied Jupiter’s energy emissions in the radio band in order to get a sense of what’s happening below the surface. But while previous studies have been limited to specific latitudes, a recent upgrade to the Very Large Array—one of the world’s premier radio observatories—has now enabled scientists to build a global picture, albeit a limited one. “The Very Large Array is about ten times more sensitive than it was before, so now we have a much higher spatial resolution,” said Imke de Pater, who led the new study. During 2014, her team measured radio emissions across the 4 to 18 gigahertz frequency range, creating a 3-dimensional picture of Jupiter’s upper atmosphere. The analysis has revealed an active weather system in Jupiter’s upper atmosphere that’s rife with ammonia, a nitrogen-rich gas. Plumes of ammonia swell up in wave patterns to form bands tens of thousands of kilometers across. These bands are interspersed with vast cloudless regions, where dry air descends. “The overall dynamic picture [from before this study] is still correct, but now we see a lot of fine detail on that picture,” de Pater said. Alternating ammonia hotspots and deserts helps explain why, when NASA’s Galileo probe made its suicide plunge into Jupiter’s atmosphere in 1995, it recorded nitrogen levels much higher than planetary scientists expected. 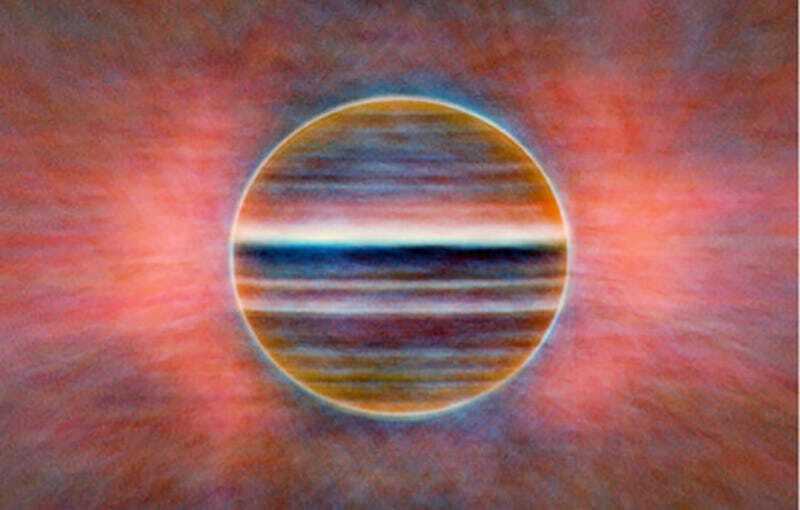 But another Jovian mystery—whether the planet features a deeper layer of water clouds—remains unsolved. Both water and ammonia are trace components of Jupiter’s atmosphere, which is dominated by hydrogen and helium. Whatever processes caused Jupiter to be enriched in heavier elements may have laid the groundwork for the formation of Earth, Venus, and Mars. Some scientists have even gone so far as to speculate that planets like Jupiter are necessary for the formation of planets like Earth. But we can’t be certain until we have a better idea of what’s really cooking inside our friendly neighborhood gas giant’s core. To that end, NASA’s Juno Mission will pick up where ground-based telescopes have left off. The spacecraft is slated to arrive at Jupiter on July 4th and begin its primary science mission in November. During a series of several dozen orbits, it’ll be using a suite of state-of-the-art instruments to probe deep beneath Jupiter’s cloud tops, down to depths many times deeper than what’s possible from Earth. Juno will be able to reveal Jupiter’s elusive water layer and measure the overall abundance of oxygen in the atmosphere, in addition to probing the roots of the Great Red Spot, which are thought to run very deep. When all’s said and done, in a few years, we’ll have a much better understanding of the forces stirring the most powerful planet in our solar system—including, perhaps, how they helped bring life on Earth into existence.